A stunning huge and bright colourful bromeliad, a landscapers favourite feature plant. 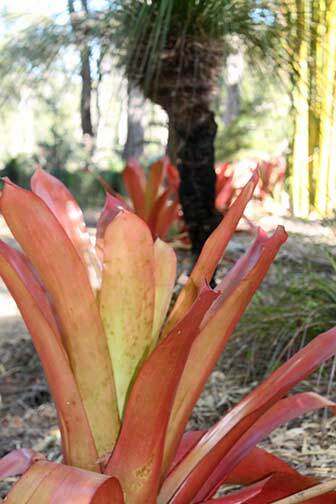 It produces a large orange bloom that lasts 3-4 months and is one of the few bromeliads to adapt to full sun. Please be careful of the sharp spines and plant accordingly. Very tough plant, handles full sun, dry conditions, and is even salt tolerant. During the growing season it is advisable to keep water in the funnel at the centre of the rosette most of the time. Keep the soil barely moist - only water when the soil is dry to the touch.